The term "ஆழ்வான்"("Āzhwān") means "one who delves deeply into a chosen field and remains deeply immersed in it"). "Āḻvār" is a term of respect. The Āḻvārs were a distinctive group of Tamil Vaishnava saints who delved deeply into the Divine through intense devotion or Bhakti. They experienced the Ultimate Reality in and through everything that they saw in the world of existence and poured their love and adoration for Him into beautiful poetry. The Reality that they experienced was not only transcendental but also all pervasive and immanent. The physical world is like the body of the Lord and the Lord is the life and soul of the physical world. The most important attribute of the Lord is His compassion, represented by "Śrī" who eternally resides in His heart. "Śrī" is Mother Lakshmi, Who intercedes on behalf of the embodied souls and helps in their ultimate redemption. Hence Nārāyaṇa is known as Śrīman Nārāyaṇa. Śrīman means – the Lord of Śrī, the word indicates eternal association. Thus the word "Śrīman" implies the inseparable union of Śrī with the Lord and therefore indicates only the Divya Dampathi (the divine couple). Surrendering to the Lord in utter devotion or Bhakti is the simple means advocated by the Āḻvārs unlike other systems including the Vedic injunctions or practices. If the Reality is the ultimate cause of all physical forms in the cosmos and the substratum of their very existence, then it must exist in and through all of them. In fact nothing could theoretically exist without the underlying Reality. They visualized Him in all His great Avatāras on this earth such as Matsya, Kūrma, Varāha, Nṛsiṁha, Vāmana, Rāma, Krishna and others, which He had taken from time to time for the sake of human redemption. Śrīman Nārāyaṇa not only was in their hearts but also in the skies, the rivers, the clouds, the mountains, the oceans, the lovely images in the temples ("Arcā Avatāra") and in short everywhere. Their poetic verses give true meaning to temple worship where the icon is a symbol of the Lord but nevertheless imbued with the Lord like every atom of this physical universe. Collectively, these verses constitute the Nālāyira Divya Prabandham, which amounts to 4000 verses. According to tradition, they are equal to the Vedas, in both their revealed knowledge, and in their importance to religious life. Unlike the Vedas, which were in Sanskrit and could not be learnt by all and often restricted traditionally to some classes, the Divya Prabandham being in vernacular could be learned and recited by anyone interested. Included by posterity in their company is the Śrī Vaishnava Āchārya, Śrī Rāmānuja. Technically, the Divya Prabandham only has 3892 verses, if one omits the 108 benedictory verses on Śrī. Rāmānuja. "Especially in some parts of the Drāviḍa [southern] regions of the country through which the Tāmrabarani, Kritamālā, Payasvinī, the very holy Kāverī and the great west-flowing Mahānadī (Periyār) have their course, devotees of the Lord will specially abound. O King! Those who drink the waters of these rivers will become purified in mind and will generally develop devotion to Vāsudeva, the worshipful Lord." (Bhāgavata Purāṇam, Sk XI-5- 39-40). The Āḻvārs all hailed from the region in Tamil Nādu adjoining the rivers Kāverī, Pālar and Tāmrabarani. They were all from different walks of life, different social strata, and different periods. Yet they were amazingly unified in their vibrant divine experiences and their philosophic views. They were revolutionaries of their times. They were above all caste distinctions: for them, being in the devotional service of the Divine alone mattered. Some believe that they appeared at a time when Hinduism was facing challenges from other religions such as Buddhism and Jainism and came out strongly against the blind Vedic rituals and deep sectarianism. The teachings of the Āḻvārs brought the true spiritual message of the Vedas and the Upanishads to the masses in their own vernacular and helped in some ways to reduce human exploitation. Although the details of their life stories are somewhat limited, what we know of them is truly elevating to all spiritual aspirants. The origins of some of the Āḻvārs are attributed, in traditional account, to mystic births as incarnations of the Lord's divine ornaments and eternal attendants (Nitya Sūrīs). The first three of these great saint-sages, namely Śrī Poigai Muni, Śrī Bhutat Āḻvār and Śrī Pei Āḻvār— called the Mudhal (First) Āḻvārs, were contemporaries. They are believed to have lived in the Dvāpara Age and were considered to have had mystic origins. Thirumaḻisai Pirāṉ is said to have been born of a sage. Kulaśekhara Āḻvār and Thirumangai Āḻvārs were kings and hailed from the ruling class. 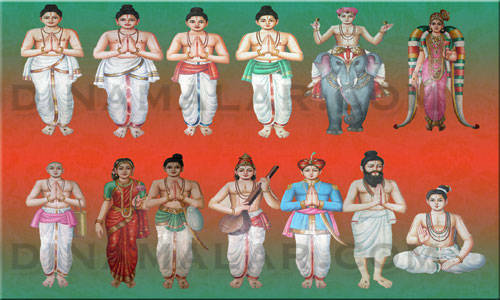 Śrī Periyāḻvār, Thondaradipodi Āḻvār and Madhurakavi Āḻvār were from Brahmin families. Śrī Nammāḷvār was born in a farmer's family and Tiruppānāḷvar was from the Pāna community considered at the time to be a low class outside the fold of the caste system. Śrī Godā (Āṇḍāḷ) was considered an incarnation of Bhū Devī (Mother Earth) and was found in the field by Śrī Peri Āḻvār much like Śrī Sītā was discovered by King Janaka of Śrī Rāma Avatāra period. The presiding deity from Thirukkovalur temple, Lord Trivikrama, along with Śrī Mahālakṣmī, eager to mingle with Their devotees, appeared amongst them although not revealing Their presence. However, the Āḻvārs felt Their presence as a sense of pressure in that small space. This led to the spontaneous outpouring of the three sweet and fragrant garlands of verses, each containing one hundred verses in the Andādhi style, each following the other, beginning with Śrī Poigai Muni. Śrī Poigai Āḻvār glorifies the cosmic aspects of the Lord by starting with — lighting a lamp with earth as the base, the surrounding oceans as the ghee and the burning Sun as the light. Śrī Bhutat Āḻvār follows with —lighting a lamp with devotion as the base, love as the oil, the sweet mind as the wick and the knowing self as the shining flame offering all of them to the Lord. When these two lamps were lit, the Lord could no longer hide His presence. The various poetic works of the Āḻvārs would have been lost except for the efforts of Śrī Nāthamuni, a sage who was the grandfather of Śrī Ālavandār, the spiritual Āchārya of Śrī Rāmānuja. Śrī Nāthamuni apparently heard the ten verses of Tiruvāymoḷi, one of the works of Śrī Nammāḷvār, which glorifies Śrī Ārāmudan of Tirukuṭantai, being recited by some bards. This decade as all other decades in the series, ends with the words "this ten verses amongst the thousand". Hearing this, Śrī Nāthamuni enquired the singers about the rest of the thousand verses. However they could not help him in his quest. Śrī Nāthamuni, being a great Yogi, apparently sat in deep meditation invoking the blessings of Śrī Nammāḷvār himself. Pleased with his ardent prayers, Śrī Nammāḷvār apparently revealed not only his own works but also the works of all the other Āḻvārs. The Nālāyira Divya Prabandham was thus passed down from Śrī Nāthamuni, to his grandson, Śrī Ālavandār. While Śrī Ālavandār did not live long enough to directly supervise Śrī Rāmānuja’s initiation into the works of the Āḻvārs, Ālavandār’s disciples did. It was Śrī Rāmānuja, who popularized the poetry of the Āḻvārs by including them in Śrī Vaishnava religious practice. Because of this succession of Āchāryas— Nammāḷvār, to Nāthamuni, to Ālavandār, to Rāmānuja — we have the Nālāyira Divya Prabandham today.